2007+ Jeep Wrangler HD mounts. 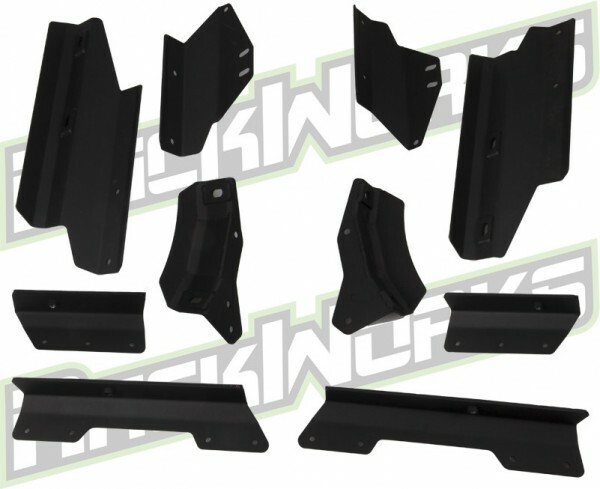 The ultimate Jeep Wrangler mounting brackets. This mounting bracket kit was designed specifically to mount our Rubicon Series roof racks through factory hardtop into factory roll cage. There are two sets of brackets to achieve this. The underside mount set bolt into your factory roll cage (no drilling) supporting the underside of the hardtop. The top set of mounts bolt directly to the side of our Rubicon Series roof racks and rest on the roof of the hardtop. Two sets of mounts are connected from the inside (UP) through hardtop using (4) rubberized comfort grip threaded handles and into the top mount set. (4) 3/8 dia. holes are drilled through the hardtop. The load of the roof rack and contents are transferred directly into the factory roll cage giving you the strongest and best support to handles years of abuse! 2 layers of adhesive backed NEO/EPDM closed cell strips protect the steel mounting brackets against the fiberglass hardtop surfaces. The result restricts any moisture (rain, snow, ect) from getting inside the vehicle while providing light cushioning against the mounting surfaces. • Allows use of Rubicon Series rack with and without Factory Hardtop. • Allows removal of Freedom tops when installed. • Cad designed for exact fit. • Precision Laser cut and formed. • Use of Pem-nut inserts for minimal hardware. • Rain and Snow restrictive NEO/EPDM strips and cushioning. No Leaks! • Rubberized comfort grip threaded handles. • Large mounting surfaces to spread load evenly and safely. • Load capacity: 600lbs Static (not moving), 300lbs Dynamic (moving).